So today's xkcd comic is setting the Internet on fire (and trending on Twitter earlier), and with good reason. It's breathtaking. According to Comic Mix it may be the biggest comics panel ever, and exploring around it reminded me of the sense of wonder that Super Mario Bros. creator Shigeru Miyamoto says that he wanted to capture in the original game. (Coincidence that there's an extended Mario riff in the xkcd comic? As the guy with the balloon says, the world (our world that is) is so big, and that's something that strikes me at odd times. Sometimes I'll be sitting in my car in traffic, and I'll think, "There's at least one person in every one of these cars, and every one of those people has at least 16 years of experiences and memories on this Earth. Every one of them loves someone and is keeping a secret from someone and wants something so much." It's staggering. And that's one stretch of road at one moment. Extrapolate it to the entire world and it's not just staggering — it can stop you in your tracks. Choice is one of the hardest things writers deal with. As a writer, you can tell the story out of any of the people on that road, or in the world, or in worlds that don't exist. It's hard as hell to nail down. I love writing (I recently tweeted that probably means I'm doing it wrong), but I'm in my least favorite part of my next project right now - Russell T. Davies calls it The Maybe. Anything could happen, and it's your challenge to figure out what the hell will. It's an uncomfortable space and I'm a fairly structured person, and I'll feel worlds better when I've got everything organized into an outline. Until then, my brain is never truly at rest, which is exhausting for me and the people around me. What does that have to do with xkcd? 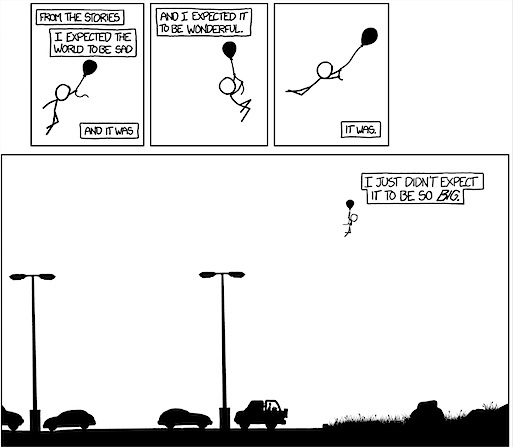 Well, as the guy with the balloon says, the world (the world of this one comic) is so big. And as you drag your mouse around it, you encounter dozens (I'm guessing - I didn't have time to check out the whole thing, I confess) of Randall Munroe's characteristic stick figures, all frozen at one moment in time. It's not sequential storytelling in its truest form. The sequence of events is that you discover different parts of the world. But, what if it was? What if each of those people in the comic were then given a subsequent moment, and then another? What if you went back every day and followed their adventures? Could you take the choice that's inherent in writing and, through a massive and persistent world, make it into a choice for readers? You couldn't possibly follow all of these people every day, but could you find your favorites and look out for them? Could a team of creators take a persistent and massive "world map" like this and tell distinct stories about different characters, who move across the landscape and occasionally encounter each other? Could you create the equivalent of a Massively Multiplayer Online Game, but for comics? I don't know, and people with brighter minds than mine have probably already considered it. But this one comic certainly opened my eyes to a lot of possibilities. A lot more choices. And hell, the world was already so full of choices.